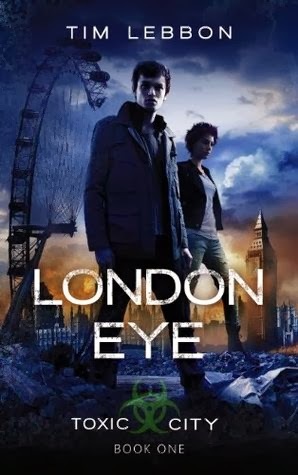 London Eye (Toxic City, 1) by Tim Lebbon, October 2, 2012. 228 pages. Published by PYR. Source: publisher. Even though their movements describe a strange, hypnotic beauty, she is certain that the rooks are going to kill her. 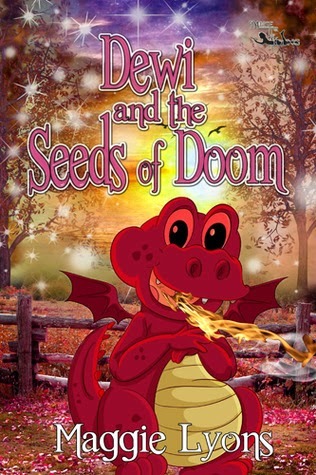 Dewi and the Seeds of Doom by Maggie Lyons, October 2012. 69 pages. Published by Halo Publishing International. Source: Author. "Ouch!" Something hit Dewi's snout, bounced off, and flew over the rocks in front of him. Assassin (Lady Grace Mysteries, 1) by Grace Cavendish, September 28, 2004. Published by Delacorte Books for Young Readers. ladies, chronicles the court intrigues that swirl around her. . . .
It’s the spring of 1569 and 13-year-old Lady Grace, the youngest lady-in-waiting to the Queen, finds herself at a glittering ball choosing amongst three suitors. But the Queen’s generosity turns deadly as threats, dark secrets, and even murder descend on the Tudor court. And it is up to Grace to use her intelligence, stealth, and curious nature to solve the mystery that threatens the very lifeblood of England. Why: I actually just picked this up from my library, and the first few pages already have me wishing I owned a copy for myself. 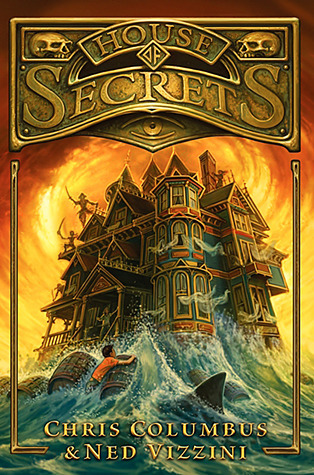 House of Secrets (House of Secrets, 1) by Chris Columbus, Ned Vizzini, April 23, 2013. 490 pages. Published by Balzer and Bray. Source: Library. Brendan Walker knew the house was going to be terrible. 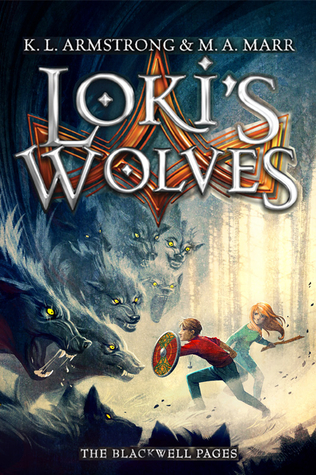 Loki's Wolves (Blackwell Pages, 1) by K.L. Armstrong and M.A. Marr, May 7, 2013. 358 pages. Published by Little Brown Books for Young Readers. Source: Won/Publisher. In Viking times, Norse myths predicted the end of the world, an event called Ragnarok, that only the gods can stop. When this apocalypse happens, the gods must battle the monsters--wolves the size of the sun, serpents that span the seabeds, all bent on destroying the world. Matt walked through the center of Blackwell, gym bag in hand, jacket thrown over his shoulder. Angus, Thongs and Full-Frontal Snogging (Confessions of Georgia Nicolson, 1) by Louise Rennison, April 11, 2006. 247 pages. Published by HarperTeen. Source: borrowed from sister. Dad had Uncle Eddie round, so naturally they had to come and see what I was up to. 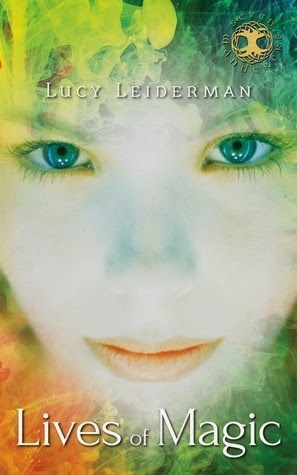 Lives of Magic (Seven Wonders, 1) by Lucy Liederman, January 28, 2014. 384 pages. Published by Dundurn. Source: publisher. Seventeen-year-old Gwen is settling into her new home in Oregon and looking forward to senior year when she is kidnapped by Kian, who warns her that she is in terrible danger. An ancient war was fought between magical Celtic warriors and three evil magicians. Those magicians are alive and well and need Gwen's magic to regain their power. If they succeed, they'll be unstoppable. To save the world, Gwen must unlock the magic trapped in her memories of a past life in Britannia. I wasn't always doing exercises in the rain, jumping around with my feet submerged in mud. So, today is the beginning of the Spring Cleaning Review-A-Thon. While I am getting a late start today on it, I have managed to finally finish a review I had been working on for nearly a month now. I am hoping to write up between 5 and 7 review over the next couple of days. While It won't clear off my review writing pile, it will put me closer to being caught up (and that's what really counts). I'll be posting a few of the reviews during the review-a-thon, but will be scheduling the majority of them for the upcoming months. All updates regarding the Spring Cleaning Review-A-Thon will be posted here. I definitely made more head-way in my "needs to be reviewed" stack then I thought I would. I am glad to say that in the end, I finished eight reviews. Three I have published, and the rest of them have been scheduled to go up anywhere from the next couple of weeks and a couple for May/June. By day, Daisy Whitney is a reporter and ghostwriter. At night, she writes novels for teens and is the author of THE MOCKINGBIRDS and its sequel THE RIVALS (Little, Brown). Her third novel WHEN YOU WERE HERE releases in June 2013 (Little, Brown), and her fourth novel STARRY NIGHTS (Bloomsbury) hits shelves in September 2013.When Daisy's not inventing fictional high school worlds, she can be found somewhere north of San Francisco walking her adorable dog, watching online TV with her fabulous husband or playing with her fantastic kids. A graduate of Brown University, she believes in shoes, chocolate chip cookies and karma. You can follow her writing blog and new media adventures at DaisyWhitney.com. 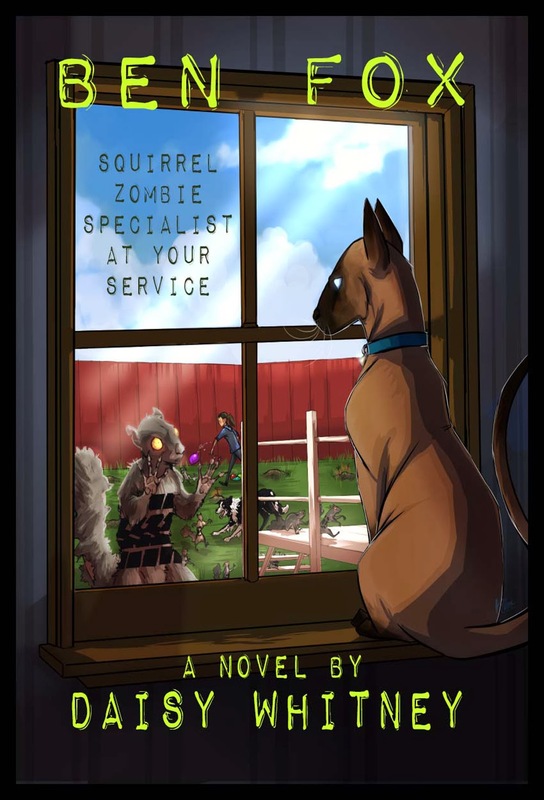 Ben Fox: Squirrel Zombie Specialist at Your Service by Daisy Whitney, October 14, 2014. Published by Spencer Hill Middle Grade. But now he’s sure of it—Percy has raised an army of squirrel zombies in the backyard and they’re ready to take on Ben's beloved dog, Captain Sparkles. Now Ben must figure out how to stop the dastardly cat, especially since Percy and his newly reanimated squirrel friends are gunning for nothing less than a full-scale Animal Zombie Apocalypse—when all the dogs start to behave like cats! 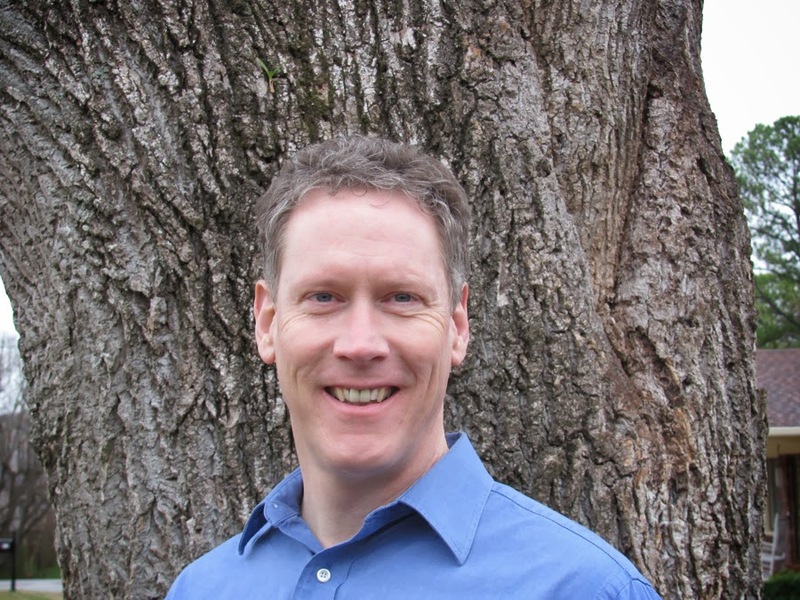 Add Ben Fox: Squirrel Zombie Specialist at Your Service to your goodreads shelf. 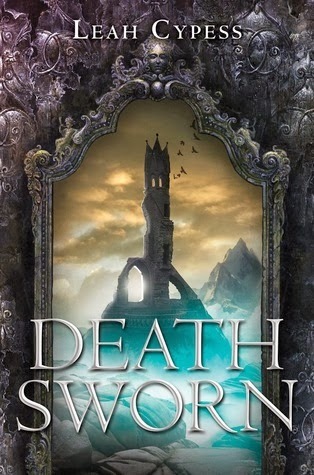 Death Sworn (Death Sworn, 1) by Leah Cypress, March 4, 2014. Published by Greenwillow Books. Why: Well, because I enjoyed Mistwood and am curious to see what will happen. As well, as because I've heard mixed things about it and want to know what I'll think of it. 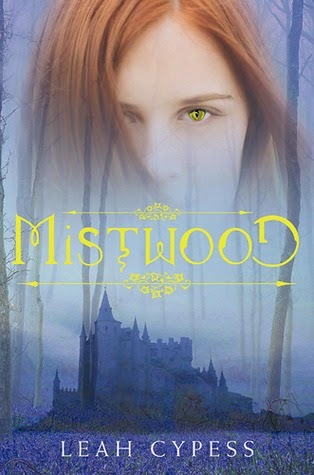 Mistwood (Mistwood, 1) by Leah Cypress, April 27, 2010. 304 pages. Published by Greenwillow Books. Source: Library. She knew every inch of the forest, every narrow path that twisted and wound its way beneath the silver branches. Alright, so, if you follow me on Twitter then you probably already know how much I enjoy revisiting a book I have already read. It doesn't matter if it's my second or twentieth time reading said tome. So, I decided that today, I want to talk about the pros and cons of re-reading and share my personal thoughts on re-reading; and get you to weigh in with why you do or don't re-read. 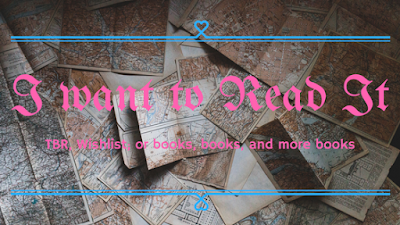 While there are always new books to be read and an never-ending TBR stack (or four) to be tackled, I cannot help but find myself going back every now and again to some of my favorite books. 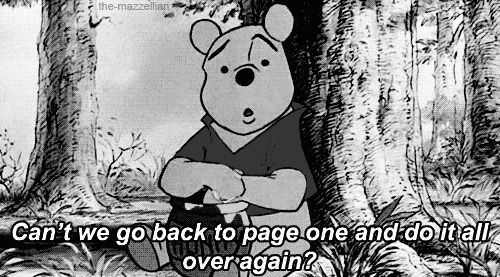 Maybe it's because I like knowing that I'll love it, or maybe I just enjoy going back to and world and characters that left an impression on me. Whatever the reason, I, personally, think we should do just as much re-reading as keeping up with the newest releases. There's one thing I believe we forget when reading. That books, especially the good ones, are meant to be read time and time again. Because there is always something new to be discovered in that well loved book that you felt the need to re-visit yet again. 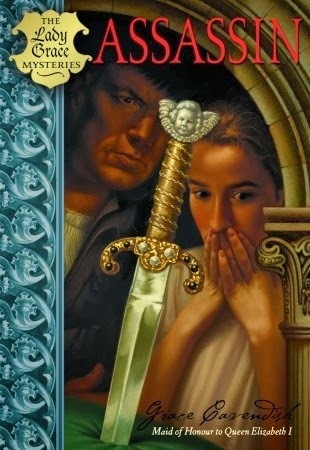 Take Harry Potter and the Chronicles of Narnia, I have read both series countless times (usually every year) and there's always something new I notice about the world, plot line, characters, or world building that I missed in a previous pass. Or even something that just hits me either fin the heart or head and makes me think about how it could pertain to real life. I know, that last one sounds a little odd, but I have pondered upon, and had many a deep discussion with my sisters over different points in the books we read and how it relates to life. There is always something new to discover within a book when reading it for the second or some time. Seeing how your thoughts on said book change, as well, as how things look different when you go back and read something you read when younger. Seriously, you will notice things you missed when you read it when your a little older. It is the perfect reset after a bunch of failed reads. Re-reading has gotten me out of a reading slump on more than one occasion, so, I'm pretty biased. There's still man books you have yet to read and you don't want to waste time by going back instead of forward. Your TBR pile(s) start to stare at you and wonder, "Am I not good enough?" Now that you've seen my reasons for re-reading; and even my pros and cons for re-reading. I want to know your thoughts on re-reading? Curious about which books I have read the most, other than Harry Potter and Chronicles of Narnia. 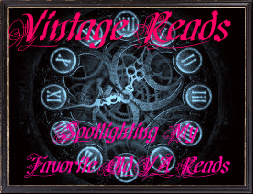 Then I may just put together my most loved book list, so, y'all can check out and maybe read some of them too ...if y'all are interested that is. I'm also considering doing occasional discussions posts here on the blog. I know, what is this madness!?! 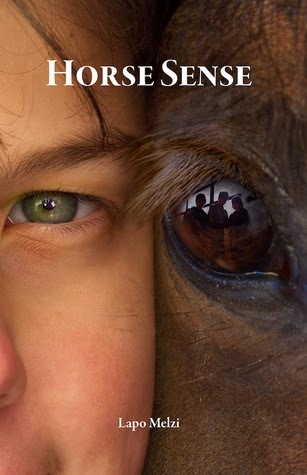 This week, I am excited to welcome middle grade author Lapo Melzi, author of Horse Sense, to the blog. Hope y'all will give him a warm welcome. 1. How did Jamie meet Acorn? They grew up together. Jamie is not only Acorn’s best friend, but his godfather. He was the only one present when Acorn was born and he was the first to cheer him when Acorn first stood up and walked. Since then, they have grown up together and spent all their time together. They are basically brothers. 2. In Horse Sense, what is the most difficult thing Jamie will face as he enters adolescence? The most difficult thing that Jamie will face as he enters adolescence is the recognition that not all people around him are good. In fact, many are bad, for different reasons, and will hurt him as soon as they have the chance. So, he must decide where he wants to stand in life: whether he wants to be true to himself and his best friend or to the people around him. 3. If you could tell Jamie just one thing what would it be and why? I would tell him, “I am very proud of you.” There wasn’t anything anybody could do to make him avoid the pain he had to go through, but that brought out the best in him and for that, I am very proud of him. 4. 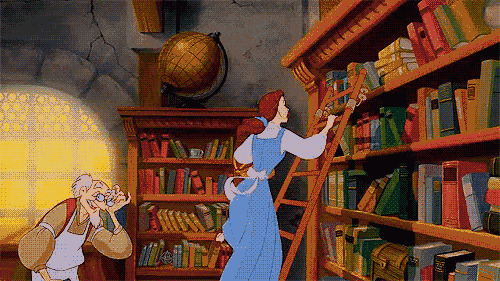 What was the last book you read the left a big impression on you? What about it made it special to you? It’s a nonfiction book: The Rise and Fall of the Third Reich. Yeah, I know fun read, you think, but it was an amazing read. Written by a journalist that was eyewitness to many of the events of WWII it is the book that actually made me understand how WWII came to happen and the personalities of many of the people involved. History is one of my interests. 5. Three people or authors that inspire you and why they inspire you? Tolkien was the author that at fourteen blew my mind away and probably ignited my desire for telling stories. The creativity, research and fun contained in LOTR are an inexhaustible source of inspiration. Hillebrand I love because of “Seabiscuit, an American Legend” and her amazing portrayal of equine and human psychology. Bill Watterson, because “Calvin and Hobbes” is the perfect combination of humor, philosophical pondering and keen psychological representation. 6. Time for a little finish the sentence fun: "When I'm not writing, I enjoy doing ________? I enjoy it because ___________?" I enjoy hiking and dancing tango. I’ve had the luck to grow up near the beautiful Alps, so I have always gone on hikes in the mountains and I love it. Being in touch with such splendor and life (and a tad of danger) makes me feel alive. Tango I was finally able to start a couple of years ago and I love it because it is a most complex dance that takes at least five/six years to master, plus it’s called the “art of the embrace” which pretty much sums up everything about it. 7. Alright, Lapo, since you split your time between living in Italy and the US, what would you say is the biggest difference when it comes to living in both countries? Is there one thing you like more about one than the other? There is a pretty huge difference in the style of life between the two countries. I prefer the US when it comes to working with people, because people understand teamwork and want to get things done. Italy I prefer because your worth as a human being is not tied to how much you “work!” and therefore you can enjoy your time much more. My writing cave in the winter is my bedroom and it thoroughly depresses me. My spring/summer/autumn cave instead is a nice park right on the shore of a beautiful lake nearby. My favorite spot is a bench surrounded by three lush trees that affords me just the right amount of shade and at the same time offers a nice view of the lake. That’s where I wrote most of Horse Sense. I am working on “Moonboy” right now, the tale of the last soon of the Moon who sets up on a quest to build a bridge to reach Eera, the planet around which the moon revolves, in order to find a friend. Next, I will write “Quigley”, the story of a pet flying squirrel in New York that escapes from his apartment and with the help of an ex-experiment rat strives to free the squirrels of Central Park from the tyranny of a band of hawks. Thanks so much for stopping by Lapo. It was a pleasure chatting about your book; also, way cool that you included Tolkien as one of your answers (he's definitely a great writer). Horse Sense by Lapo Melzi, October 14, 2013. Published by Irbis Books. You can add Horse Sense to your Goodreads shelf. The interesting things I find when going through my inbox. when I saw this in the Booklikes email I knew I would have to join in. Why, because I still have some reviews that I'm trying to knock out and this seems like the perfect motivation to get it done. The Spring Cleaning Review-a-Thon is hosted by Lenore @ Nocturne Romance Reads and Lori @ Romancing the Dark Side. For more information and to join in click banner. My goal is to finish the stack of un-reviewed books sitting by my chair, as well, as the ones marked on Goodreads as "Need to Review" and schedule them up. That's around 15-20 books. Come start of the Review-a-Thon, I'll post the titles here as I review them. 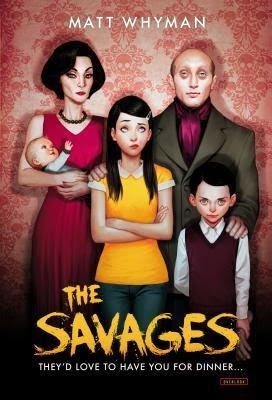 The Savages (The Savages, 1) by Matt Whyman, March 6, 2014. 288 pages. Published by Overlook Juvenile. Source: publisher. Problems start to pile up. Sasha’s boyfriend convinces her to try going vegetarian for a month, but then leaves her for a vegan vigilante. Angelica attempts to pay her mounting credit card bill by allowing commercials to film in the family home, until one of Ivan’s pranks leaves a model dead in their bathroom. A detective hired to investigate Titus’s predatory business affairs notices the model’s disappearance, and starts to think that there may be something more sinister to the perfect-seeming Savages. He’s right, of course—they’re cannibals. At the table, Titus Savage spotted his son picking his teeth with one finger. England, 1811. Few are aware of a hidden magical England, a people not ruled by poor mad George, but the dying King Pellinore of the House of Pendragon. Only to be abducted from the man she loves by the man she loathes. But devious and ruthless, Persephone must defy ancient prophecy, embrace her Dark magic, and seize her own fate. 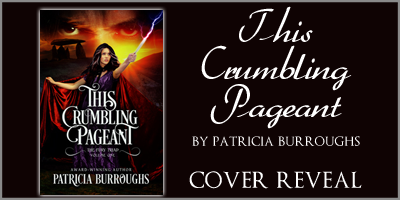 Be swept away into the first book of a dark fantasy series combining swashbuckling adventure, heart-pounding romance, and plot-twisting suspense. Robin slid the slender youth’s body from the expensive saddle and staggered backward, not from the weight, for in truth, the boy weighed little, but from the reek of Shadows. He eased the boy onto the ground. The boy’s body was limp and his skin was hot and damp with sweat. Robin fumbled with the boy’s heavy jacket and grabbed the lapels to yank it open. The boy moaned. “Trifolium, then...” The boy’s head fell back into the dirt. “I know sigils,” Robin said, amending silently, if I can remember the Greek ones from the schoolroom. If he got the scamp past this spell of poisoning, he was going to thrash him. “You evaded my question, which is answer enough, may the gods deliver me,” the boy retorted with equal venom. At the moment, Robin just needed to come up with an acceptable prayer. He held his hands over the boy’s body and called, “Away, away, from your feet and from all your limbs... erm... Shadows and every muscular pain!” he finished with a wince. Award-winning screenwriter and best selling novelist Patricia Burroughs loves dogs, books, movies, and football. A lifelong Anglophile, she treasures her frequent travels in the British Isles researching The Fury Triad, the epic fantasy that has taken over her life and heart. She and her high school sweetheart husband are living happily ever after in their hometown of Dallas, Texas. 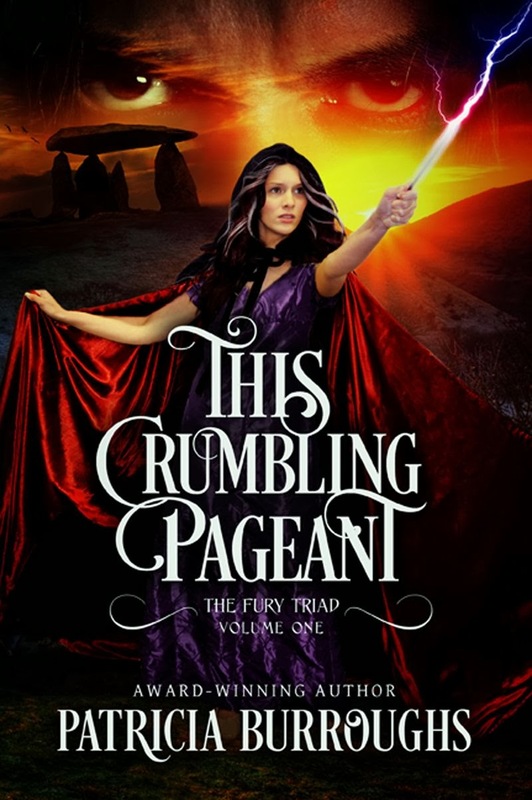 Autographed Paperback ARC of This Crumbling Pageant. Feral by Holly Schindler, August 26, 2014. Published by HarperCollins. Why: Now this sounds like an excellent read with a dark mystery. Definitely curious to see what the answer will be at the end of the book. A Draw of Kings (Sword and Staff, 3) by Patrick W. Carr, February 18, 2014. 464 pages. Published by Bethany House Publishing. Source. Chapter by Chapter Blog Tours. 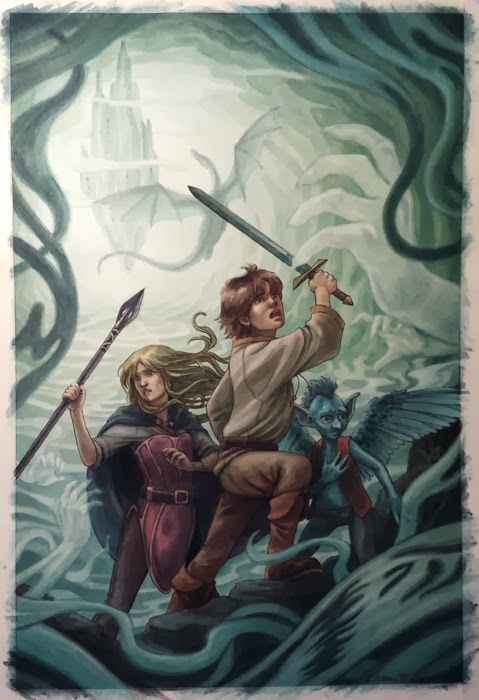 Deep within, Adora continued to harbor the possibility that her uncle, King Rodran, might still live, but the pallid faces of those on the ship, especially Errol's, refuted all hope. While I enjoyed the writing and world building of A Draw of Kings, I wish I had been more familiar with the world and how things got to where they are in the third installment of the series. So, while there are many good qualities to Patrick Carr's book, make sure you read all of them to avoid the confusion I felt. 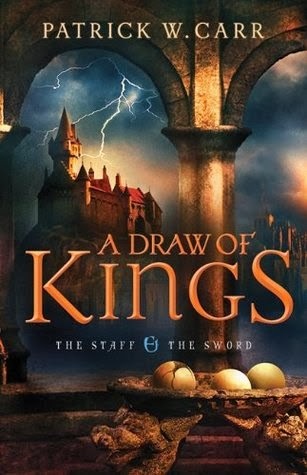 So, even though I really enjoyed reading A Draw of Kings, like I enjoyed the story, plot, and author's writing, there were a couple times that I just did not care for the characters. I felt a disconnect with each of them because I, guess, just wasn't invested in what happened to them since; although, the further I read the more I invested I became (guess it just took me some time to warm up to them). The two things I really enjoyed about A Draw of Kings would have to be the world-building and how the story played out at the end. 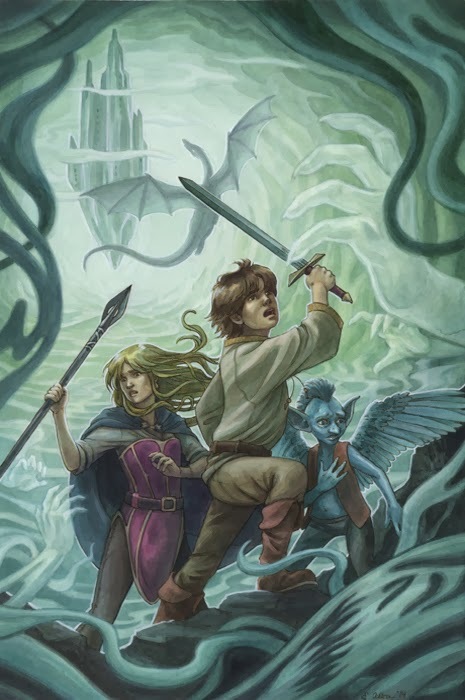 I thought Patrick Carr did a great job weaving the the darkness of the opposition and their quest to destroy Illustra with that of the heroes' quest to regain the barrier that protected them for years. It was just so interesting to see the differences between both sides, and, seeing the way things played out was quite interesting because one step either way would have changed things tremendously. 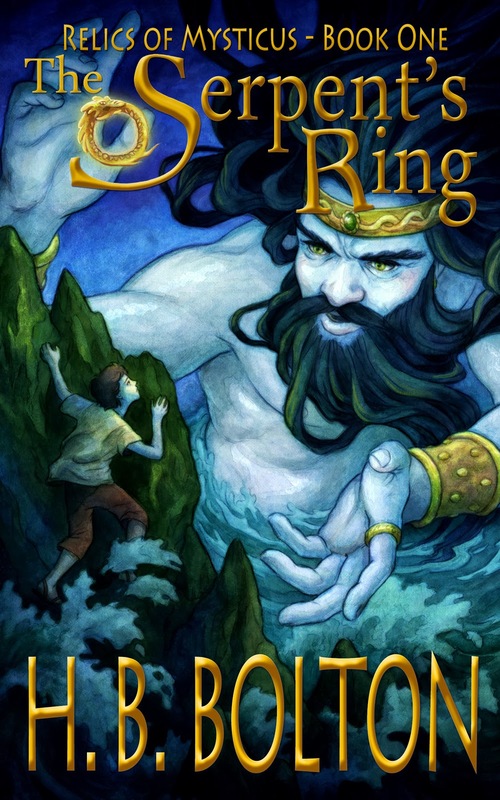 Based on what I read in the third installment, I would recommend this to fans of high fantasy because there are so many things to enjoy between the actual story and the writing. While I enjoyed reading A Draw of Kings, there is one reason I did not enjoy it as much as I hoped I would have. That being that I felt like I was missing so much to the whole story-line by jumping in at the third book. 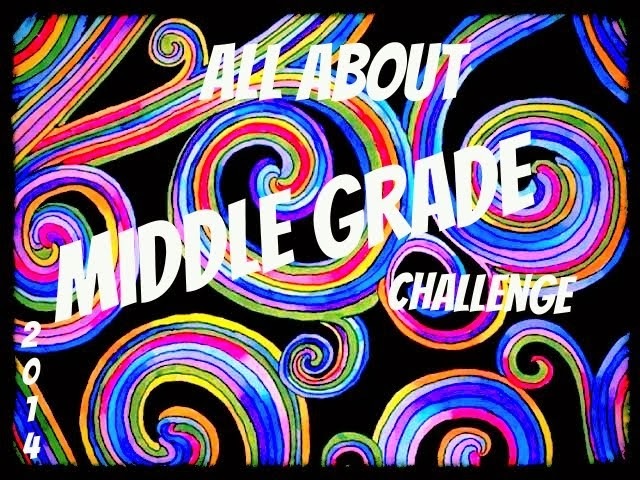 There were so many things I wanted to know, like, what happened leading right into the first chapter and how the previous plot-lines got the story to this point. Sure, there were a few tidbits thrown in from the previous two books, but it really made no sense because it doesn't give the full story of what happened and how it affected the various characters. So, again, this is an enjoyable book, but I definitely recommend reading all the installments before tackling this one. Final Verdict: A Draw of Kings- Good world building and writing make this an interesting read for fantasy readers. My name is Heidi Bolton, but I use my initials for my writing name, H.B. Bolton. 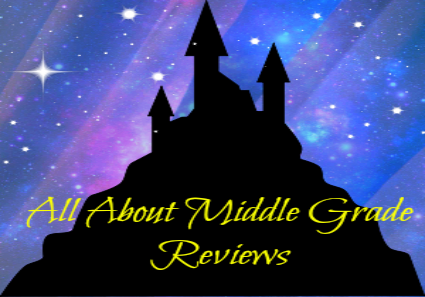 I’m the author of the middle-grade fantasy series, Relics of Mysticus. 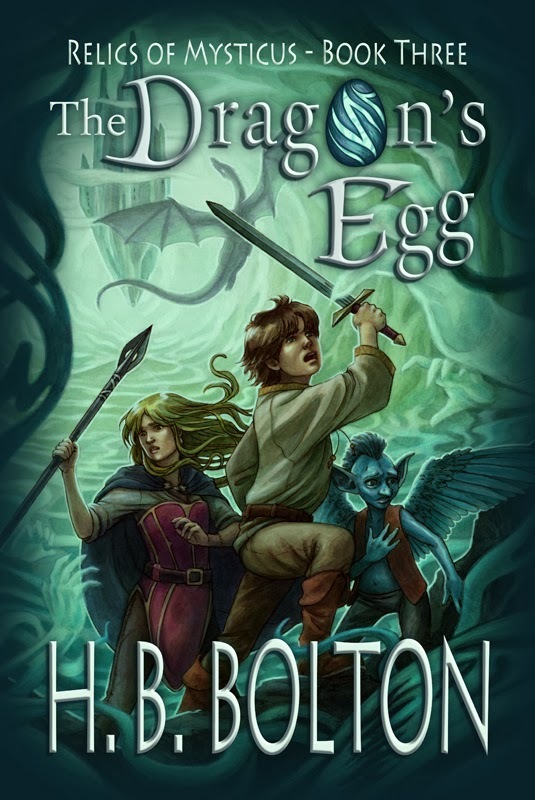 The Dragon’s Egg (Book Three) is in the final stages of development and is almost ready for its May release date. Today I’m thrilled to have the opportunity to share my newest book cover with you. Cover artist, Elisabeth Alba, offered an inside peek of her work’s progression through her photographs and commentary. I’m extremely fortunate to know this Scholastic Book illustrator and have had the privilege to benefit from her talents for all three of my covers. In fact, we’ve already started talking about The Mummy’s Amulet (Book Four). I met Elisabeth about 14 years ago through one of my drawing classes. From her high school freshman year through senior year, she was one of my students (a favorite one, at that). I taught advanced-placement art, which was before having children of my own and creating worlds with unlikely heroes for my mythical stories. Thank you, Elisabeth, for helping to bring my characters to life! As a bonus, I’m offering a free eBook version of The Serpent’s Ring (Book One) through Amazon from March 10-13. This is a progression of The Dragon’s Egg book cover from sketch to final drawing. Truth be told, I haven’t illustrated many multi-figure images before, and then add a ton of stuff happening around them, so I was in for a challenging composition — a fun challenge! You can see how I gradually worked out and tightened the image. In the beginning, I had planned to make the background darker but then realized if the glowing fog was everywhere, then it wouldn’t be so dark. It framed the floating castle better as well. Once I figured out the drawing, which I did digitally, I worked on a color composition to figure out how I would paint it. This was an important step — especially since watercolor is really hard to fix if you make a mistake. At this stage, I printed the line drawing onto watercolor paper and got to work. I painted with Dr. Ph. Martin’s Hydrus fine-art liquid watercolors to start. I painted the base color first, which in this case was greenish. After painting more of the base colors, I decided to do some line work with pen and ink to solidify the shapes. Once the base colors were done, I sealed the image with matte medium. The Hydrus watercolors can be difficult because they are not like normal watercolor. Once they’re down on paper, you can’t wipe them away, but sealing with matte medium helps them not to smear — which is nice! You can also see how my desk lamp caused some glare over the castle when I took the photo. 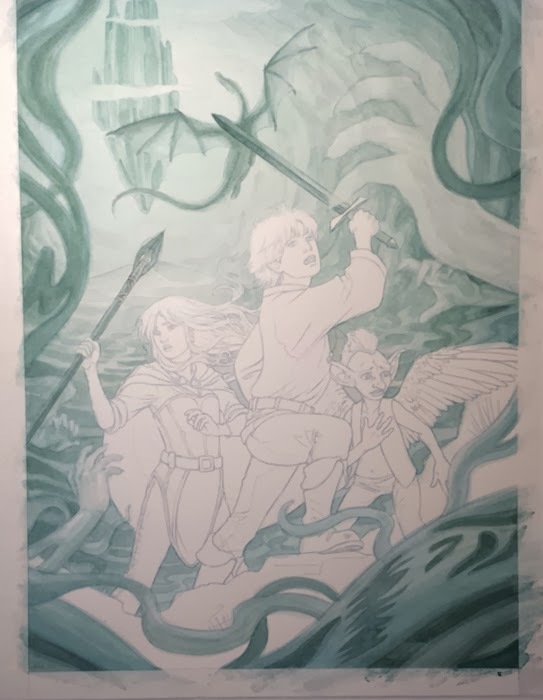 On top of the matte medium, I painted with acryla gouache to darken and saturate the colors, and to do any highlights like the edge lighting around the figures. Finally, once the painting was done, I sealed the entire image with Kamar varnish. It brought out the colors even more, because once the acryla gouache dried, it became matte and the colors faded some. Once I scanned the image, I worked on any digital touch-ups (some things are hard to do in watercolor, like getting colors really dark, and also the colors sometimes don’t scan well). This was how it looked once scanned, before any touch-ups. It was a more faded and less vibrant version of the original painting. I also lost the highlights. Finally, after all of the digital work was complete, the cover was ready for text. For the typography, I added a dark-blue gradient around the edges to frame the image and help the text stand out. I’ve used the same font for all three books, but in this one, I replaced the “O” in “Dragon’s” with the actual Dragon’s Egg relic. Sure, the glass castle floating over Evan’s head makes him uneasy, but that’s the least of his worries. With each step inside the Dungeon of Dreadful Dreams, he must battle against his worst nightmares. One after the other, wispy smoke-filled bull sharks come at him — he must remember they’re only illusions pulled from his imagination by those dreaded shadowlike hands. If only the vengeful dragon circling above was also an illusion and didn’t have his mind set on destroying the one person who can control him: Emrys. Inside the castle’s glass tower, Emrys sleeps in an eternal slumber, and Evan’s uncertain whether he can save the great wizard. Especially now that Emrys’ former student, the Lady of the Lake, has joined forces with the cunning immortal Alamaz. Together they have already stolen the Dragon’s Egg, but their greed doesn’t end there. The Siren’s Pearl calls to them, and that means only one thing … Atlantis is in trouble. 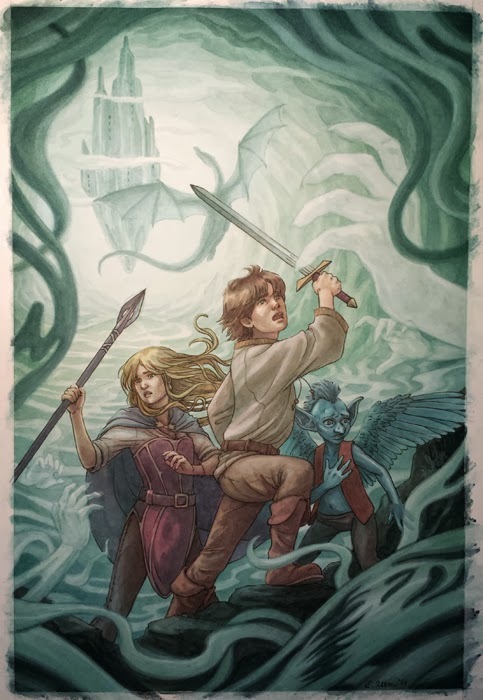 Join Evan, Claire, and Dunkle — along with a few other unlikely heroes — as they travel across the realm of Medieval Legends, float through the Ancient Isle of Avalon, plunge inside the Dungeon of Dreadful Dreams, and be there when Atlantis rises once again. Elisabeth is a Queens-based illustrator whose work focuses on fairy tales, fantasy, and historical subjects. She earned her MFA in illustration at the School of Visual Arts in New York City. 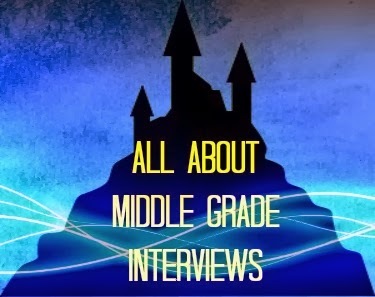 Her clients include Scholastic, Simon & Schuster, and Henry Holt Books for Young Readers. Elisabeth wants to thank Heidi for being the best high school art teacher ever, and setting her on the path to becoming an illustrator! 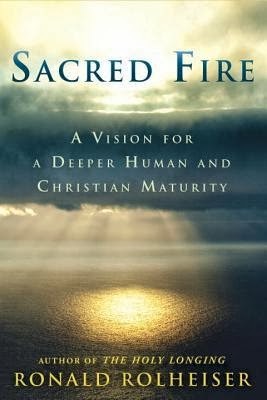 Sacred Fire: A Vision for A Deeper Human and Christian Maturity by Ronald Rolheiser, March 11, 2014. 368 pages. Published by Image. Source: Blogging for Books/publisher. I would be lying if I did not mention this. But I'm pretty sure that Sacred Fire is one book I'll have to re-read at a later date because I feel that, perhaps, I am not in the proper time in my life to find it completely relevant to my spiritual needs. While I feel that this would have been better if I were older, there were still a lot of things that I was able to take away from it. One of the things that was pretty eyeopening, for me, was the correlations that Ronald Rolheiser made between the crucifixion of Jesus and how he transformed all the hatred being sent his way into love. It was interesting because I had never really considered the passivity that he showed and how he gave back love from such a humiliating situation. It definitely gave me pause, and made me inspect my own life to see if I could/have been able to do that (verdicts still out on that). It has also left me thinking that in the conflicts that we/I face between our different beliefs is an opportunity for everyone to listen and show compassion, even when we don't see eye-to-eye. Just this one aspect of Sacred Fire, has me wanting to try even harder to not perpetrate hate and discord in our already strife filled world. While that is just one of the things I enjoyed and found something of important, there were many other reasons to enjoy this book as a whole for what it offered. There were also a few other things that definitely had me thinking and pondering whether or not I could try to be better (which, I'll be the first to say how imperfect I am). The other thing that stuck with me after finishing Sacred Fire, would have to be the chapter of Its Crowning Glory, Blessing Others. Why, because how many times have we inadvertently "cursed" another because they were better at something them we ourselves were. Personally, I had never really considered my annoyance at someone for being to loud to in fact be a form a cursing them, rather than blessing them. It just gave me so much to think upon, especially as I embarked on reading this during the first few days of Lent. As to why I believe I be needing to re-read this at later point in life, well, that's easy. I just feel that this was perhaps aimed at someone who is more established in life and looking to continue giving of their life. While that's not to say that I'm not giving (I try), I still feel like I am still working towards that point. So, yeah, you could say I read this prematurely, but there was still so much to glean from this one. Final Verdict: Sacred Fire- An excellent read for those looking to deepen their spirituality in both a Christian and human centered way. Thanks to Blogging for Books and Image books, one lucky winner will receive both Sacred Fire and The Holy Longing by Ronald Rolheiser.